The scenic route to Machu Picchu. 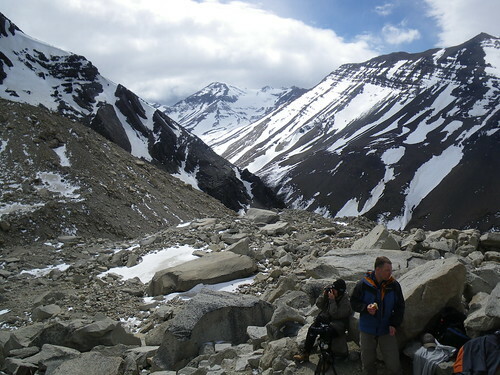 The Salcantay trek is a cheaper alternative to the Inca Trail but goes a lot higher and is therefore a lot more work. Sometimes it felt like you could reach out and touch the sky. Special thanks to Flickr user Itinerantlondoner for marking this photo as a favorite. To see a few of our favorite photos from Peru click here. Our PHOTO PAGE has links to all of our collections on Flickr. Be sure to mark some of your own favorites so that we can include them on this column. We’ll be highlighting a different photo every day. Hiking the ‘W is a must do for all backpackers who manage to make it that far south. In our opinion, most do it in a way that is either more expensive or more work than necessary. Below is what we did, then some suggested changes to our path to maximize your enjoyment and minimize your time and expense. 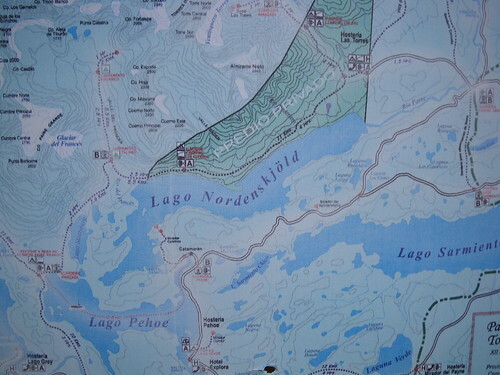 Doing this trek in 5 days, if you are a regular hiker, to me, is downright silly. If you want to do a longer hike, with less people, do the circuit. Access: To Puerto Natales there are daily buses from Rio Gallegos and Peritto Moreno (El Calafate)in Argentina. From Puerto Natales there is a twice daily bus, making the several hour trip from town to the park, the first leaving in the morning around 8am and the second leaving around 2pm. Both buses pick hikers up for the return trip from the park to town. 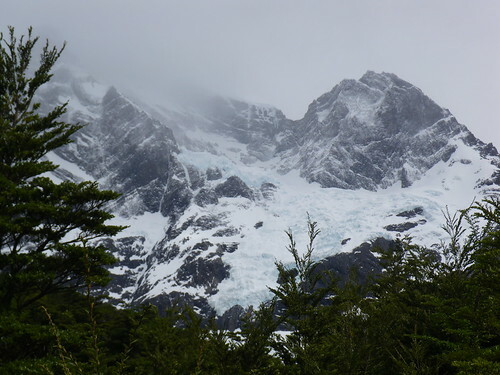 Day 1: We arrived on the morning Puerto Natales bus and made it to the start of the trail around the middle of the day. We set out immediately hiking all the way up the first leg of the ‘W’ to the Torres themselves and then back down again and almost to the second leg of the ‘W’. We slept that first night in Refugio Los Cuernos. Many would do this portion over two days but traveling with minimal gear we were able to make it with relative ease. Camping there and using the hut’s supplies rather than our own cost a couple of dollars extra but given that we didn’t need to rent equipment in town, this balanced out. It is important, even during low season to have a reservation if your planning to rent equipment. We made a reservation and they still didn’t have enough sleeping bags to go around! Plan ahead! Day 2: We had planned to get up early and hike either the second or the third leg of the ‘W’ and get to the ferry to return to the bus to return to town in the early afternoon. 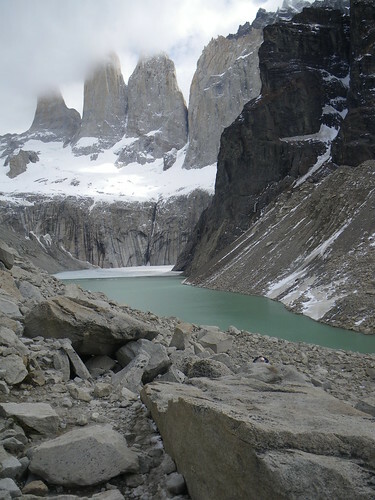 As I’d started the trek with a cold we decided to just walk to the ferry at Lodge Paine Grande, but this was only because of my failing health, not lack of time. Had I started the trek healthy and we gotten up and began our walking at first light we would have been fine to do at least another leg of the W.
One Day Hike: Not as hard as it seems. 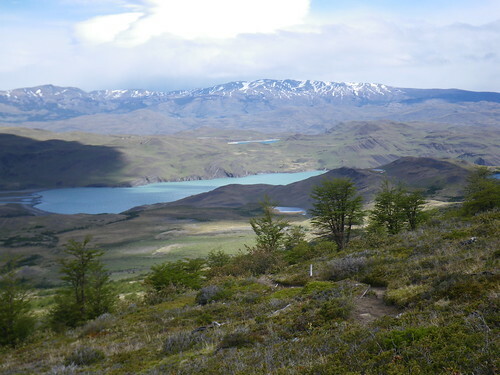 Take the afternoon bus from Puerto Natales and overnight at the first camp, staying comfortably in their lodge or huts. Begin walking before first light and you’ll have more than enough time to do the whole trek and make it to the Lodge Paine Grande camp at Laguna Azul before dark, spending a second night there and either taking the ferry the next day or walking to park headquarters to catch the bus back in the morning. This could be done in reverse as well. This is for seasoned hikers only who know what they’re doing. If there is a sudden change in weather you will likely need to alter your plans dramatically and you need to be prepared for that. You can pay to stay in the huts or in the hut campsites. Equipment is available for rent within the park for camping, more expensive than in town but you don’t have to carry it, or just stay in the dormitory or the refugios. Full board can be purchased at each hut as well so if you don’t want to carry your food either, you don’t have to. When we were there everything for purchase was cheaper if paying with U$D rather than Chillean Pesos so ask in town before departing. All itineraries above can be done in reverse. Sure there are roads for us to follow through the desert, even towns with hotels to sleep in, but one of the nicest parts about The Sudan is that using the roads and towns is completely optional. We stuck to the road, but made sure to sleep under the stars. Pulling up alongside the premier archaeological site of Sudan—the Pyramids of Meroe—around sunset the site’s caretaker directed us around the large sand dune to a big spot of desert in the shadow of the pyramids. 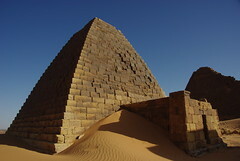 There were mountains of sand to one side, and tombs of the Kingdom of Kush on the other side. We pitched our tents and set the potjieon the fire and waited for dinner to be ready. This little episode came after we spent the afternoon off-roading a total of 60 kilometers visiting several sites where we were the only tourists to have signed the log book all week. The first two sights we visited—Naqa and Musawwarat es-Sufra—were quite amazing. Smaller versions of some of the large attractions in Egypt, these temples were not only our own to explore but hadn’t been restored, providing us with countless ‘Indiana Jones’ moments. Outside of a small ticket building (where the guards had just caught a fresh rabbit and were quite excited for the feast they were about to share) the only other people around were using their mules to pull water from the well. 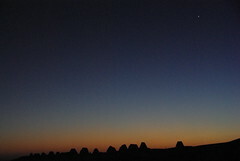 Next up were the pyramids, the ones I mentioned above where we made our camp, which were also ours to explore alone. By comparison, I hear the pyramids at Giza are within the view of a few well positioned tables at the local Pizza Hut. constantly providing us with a natural exfoliant free of charge, which also meant we didn’t even bother to change our clothes since the moment we did they were just as dirty as the last pair. The heat, naturally, was quite brutal (we intended to fry an egg on the sidewalk but never found a sidewalk) and our 25 liter jug was about enough water to last the four of us just 24 hours. I can think of no other place where I will ever have the opportunity to repeat this experience. A nice breeze. An open fire. Good food and company. Silence and solitude for miles around. My boss used to say, it was real and it was good but it wasn’t real good. That was Namibia. Namibia is a beautiful country, but it was difficult. Unable to get money out of several ATM’s, we had visions of wandering through the desert without cash or petrol. Not exactly a “real good” start. 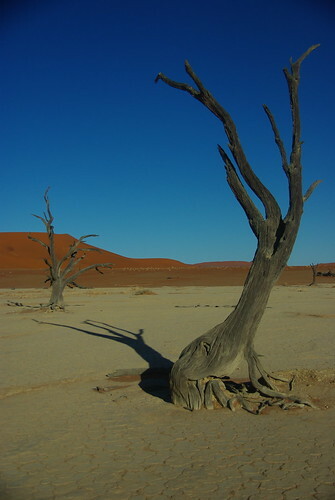 Namibia is a incredibly striking country, from the arid desert of the south to the lush forests in the north. We only had a short amount of time in Namibia so we skipped things like sand boarding, which we had done in Peru and Nicaragua and instead spent our time, soaking in natural hot springs in the desert, climbing 100m high red sand dunes for sunrise, and night time game spotting. At 65 degrees Celsius, the natural hot springs at Ai-Ais were to hot to even put a full foot in, so instead we opted for the indoor hot springs where the water is pumped into jacuzzi’s and slightly cooler. The national park accommodations were gorgeous and resembled a spa, but something about paying almost $40 a night to camp there put a bad taste in our mouth. The scene repeated itself over and over again throughout Namibia, incredible natural beauty, incredible price tag. See what I mean, real and good, just not real good. 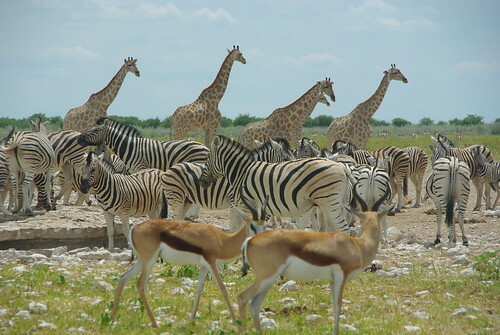 By the time we reached Etosha National Park, a park we’d heard phenomenal things about since arriving on the continent, we were wondering if it was all worth it on a trip like ours. We’ve seen a lot of game, but we went to Etosha having not seen any leopards nor cheetah. Driving through the park we felt completely alone and went nearly two hours without seeing another car, or anything besides Zebra and Impala. Just as we were about to turn around and head to camp we spotted a lion walking across the road 100 feet from the car. Pulling slowly closer, we saw two juveniles sitting in the shade next to the road. We watched the three of them from about 20 feet away, until the lions, who could care less about the approach of our vehicle, raised up slowly and walked to a nearby watering hole. Excited at the proximity of our encounter we clamored on about how happy we were until we spotted a male…sitting at the edge of the road. He sat no further from our car than two or three feet. When we zoom in on his picture, we can actually see the reflection of our car in the lions eye. Talk about incredible. In the end we saw six lions resting in the shade, but none ever as close at the male. 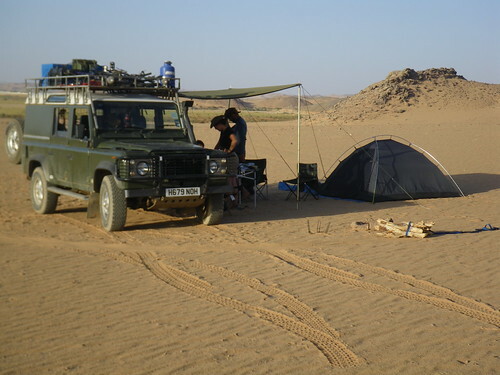 Tipped off by another traveler to say at Halali Camp for its floodlight watering hole, we pulled into camp having spent the rest of the afternoon searching for another close encounter. 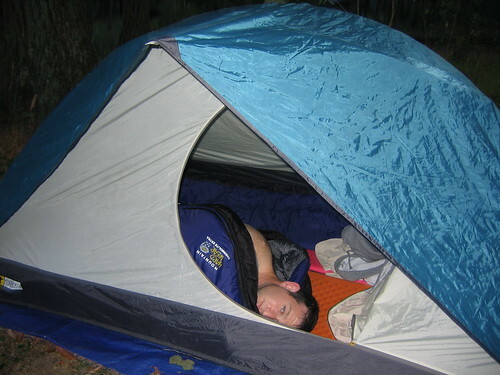 That night honey badgers came through the camp. One of the most feared and aggressive animals in Africa, no animal messes with a honey badger. Fortunately they moved on, and we wal ked out to the watering hole around 10pm. Hearing rustling, we stepped into the viewing area and immediately spotted a rhinoceros in the light. A few minutes later her calf appeared quickly followed by another rmother and calf. As they stood drinking, playing and eating, a leopard (our first sighting, finally completing the big five!) approached through the trees. Annoyed at the cats presence, the mothers stomped and false charged at the leopard. No sooner did the rhinoceroses defend their territory did we hear something approaching from the darkness. Standing at attention, the leopard decided it was time to disappear into the darkness. Like a King arriving at court, a male elephant crashed through the trees. Unhappy to find someone else at his watering hole, he chased the rhinoceroses away before drinking, splashing and eating to his hearts content. We’ve seen elephants chase buffalo, zebra and ostrich from a watering hole, but never rhinoceroses. Although the elephant succeeded in scaring off the leopard, the rhinoceroses hung in the shadows, waiting for his highness to leave. After having his fill, the elephant meandered away, or so we thought. The rhinoceroses, emerging from the darkness, cautiously approached the watering hole only to have the elephant come at them from behind. Running back into the bush the rhinoceroses waited until the elephant was completely gone, which took quite some time, before one mother and calf reappeared. In the end it was an incredible moment, best summed up by the Italian guy on the bench near us. “Wow.” Couldn’t have said it better myself. By the time we left Etosha our list of sightings sounded like a “12 nights of Christmas song”, which to our pleasure included two leopards! Etosha was definitely the highlight of our time in Namibia, and the country is certainly beautiful and interesting, but we never felt comfortable in Namibia. People were friendly, but not warm, polite but not welcoming. Granted we only spent a little less than a week in the entire country, so its really not fair to pass judgment, but we never felt that we were able to see and experience “real” Namibia.